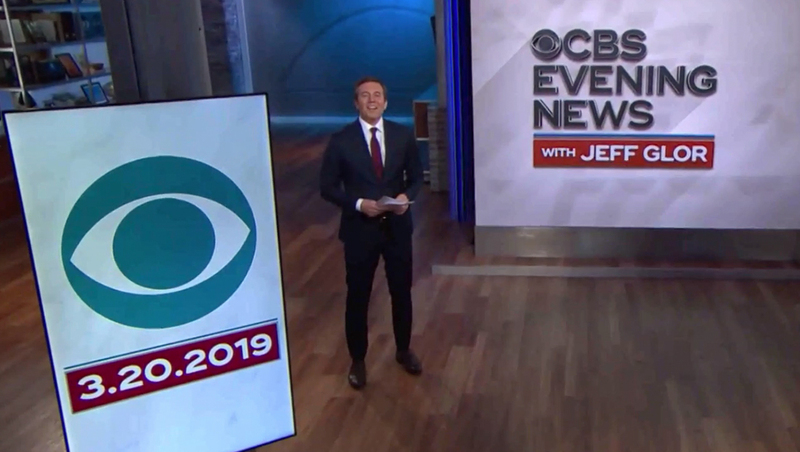 The “CBS Evening News” updated its opening format Wednesday, March 20, 2019. Anchor Jeff Glor now kicks off the broadcast standing — like he did when he debuted as the broadcast’s anchor in December 2017. However, instead of the off-axis shot with one of Studio 57’s video walls behind him as an OTS element, Glor now stands in front of the seamless video wall installed against the wall that faces the street. The broadcast continues to start with a brief collage of imagery of the news of the day and Glor appears on camera standing next to the video wall with the show’s logo on it. After the “Headlines” segment the broadcast kicks off with a push-in that includes one of the set’s vertical monitors displaying the CBS logo and current date with periods separating the month, day and year digits. The video wall, which in the format immediately preceding this change, was used behind Glor’s seated position, continues to display the show’s logo with extruded world map background during the push-in — until an animation “slides” to reveal topical imagery for the top story. The broadcast has tinkered with its format numerous ways since Glor’s debut — including changing the open in February 2018, introducing the “headlines” segment in June 2018 and having Glor start the broadcast seated.